Dump the cheesy and not so good tasting Jordan almonds. Say no to bottles of blowing bubbles, matchbooks and candles. 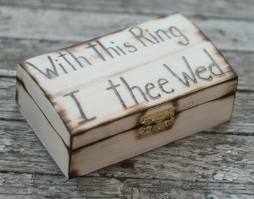 Instead, you may wish to consider choosing unique and fun wedding favors for guests to make their experience at your wedding more memorable. Many unique and fun wedding favors for guests can be customized to your weddings colors, or even a theme. Make the favor something fun, something that your guests will enjoy and use perhaps years to come. Just as your wedding vows acknowledge and affirm your commitment to grow your marriage, seed packets or seedlings as a wedding favor for your guests invite them to share by growing a live plant. Seed packets come in a variety of easy to grow flowers, like sunflowers. You can also have a special phrase or even your name and wedding date imprinted on them. 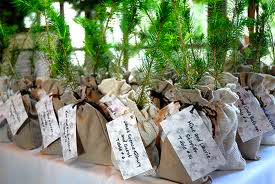 Seedlings, wrapped in a berber sack, can be transported and planted by guests in their favorite location. Share your favorite wine with guests by relabeling it with a whimsical label that contains your last name and date of marriage as the the vintage and bottling date. This unique wedding favor can be made or purchased from wedding supply stores. 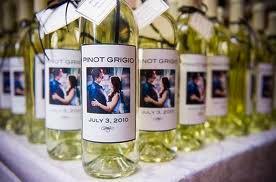 Your guests will be sure to toast and remember your wedding by getting and drinking a personalized bottle of wine. If your favorite pastime is cooking, giving your guest a personalized bottle of your favorite sauce is a great wedding favor idea. The bottle can be labeled as your brand with your surname and wedding date. 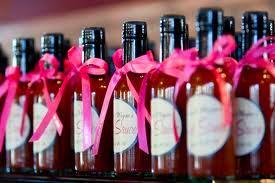 Popular bottles of sauce given as wedding favors include maple syrup, hot sauce, or BBQ sauce. The sauce you choose can reflect what is your favorite to be shared with guests. 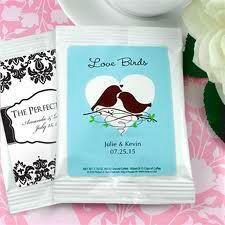 Offer your guests a warm drink by gifting personalized tea bags, coffee or hot cocoa packets. Your date of marriage, your name and a picture can be printed onto the outside packet as a remembrance of your wedding. 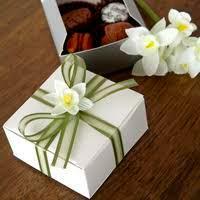 Packets can be gifted in small organza bags or even a mug wrapped in cellophane. Give your guests a fortune of good luck by giving custom made fortune cookies. 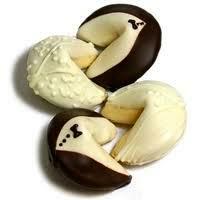 The exterior cookie can be made in a variety of colors and dipped in chocolate for a sweet treat. The printed fortune can contain a favorite phrase or even a Chinese proverb. Fortune cookies can be gifted in Chinese take-out boxes or individually wrapped. 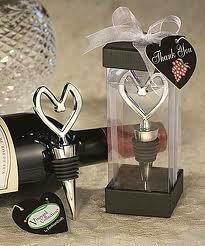 Bottle stoppers are fun gift that guests can use on wine and sparkling cider bottles. They can be found in fun shapes like starfish, love birds, hearts, and diamond rings. Your wedding date and name can be engraved in the bottle stopper or can be given with a card attached. A very whimsical and fun idea for wedding favors is a deck of cards with photos of the bride, groom, bridesmaids and groomsmen as the face for the Joker, Queen, and King. You can also have the back side printed with your wedding date and a photo. 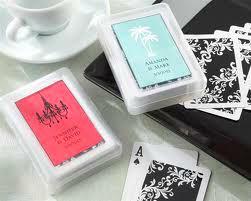 The deck of cards can be wrapped in clear plastic or tied with a pretty bow. 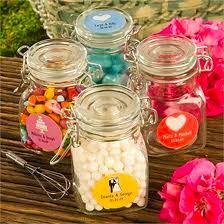 Provide your guests with a small etched or labeled apothecary jar filled with chocolate or your favorite candy. These jars can be used later on by guests for storage. The jars are simple, yet a fun way to integrate your wedding colors or theme into them. No one likes chapped lips! A fun and useful wedding favor is a gift of a small tin or tube of lip balm. The outside tin or tube can be easily labeled to match your wedding colors with your wedding date and name. 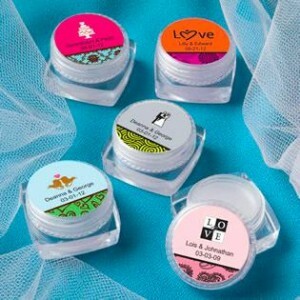 Lip balm comes in a variety of flavors like vanilla, mint, cherry and aloe. A very popular, unique and fun wedding favor for guests is the rental of a photo booth that provides guests with printed photo sheets. 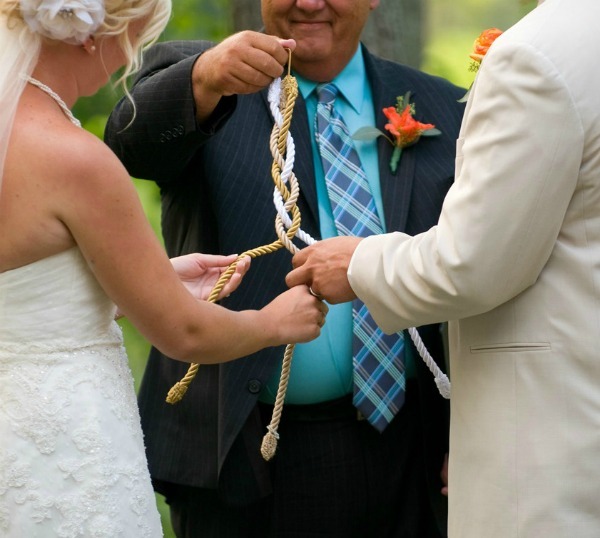 Guests can take candid and jovial photos as keepsakes. 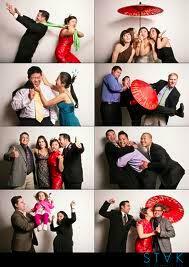 Photo booths also give the bride and groom an option to have a CD or DVD of all the photos taken during the reception. The more personal the wedding favors for your guests are, the more your special day will be remembered, making this wedding favor number one in our book.